Welcome to the third group post for Papertrey Ink's May release. Today's post is all about the guys! We know making masculine cards and projects can be challenging, so we're bringing you lots of inspiration, ideas, tips, and tricks for making those guy projects easier. Before I get too far ahead of myself, all of the May release products will be available in the Papertrey Ink store on May 15 at 10 pm. With the florals and sequins and pretty chicken scratch panel, the original definitely leans more feminine. I changed up a few elements and worked in the new Petite Places: City Station building for a totally different, and masculine, look. 1. Choose a simple layout. Lots of white space here, and not too many layers. 2. Basic geometric shapes tend to work well. No fancy shapes here, just two circles and a pair of horizontal elements. 3. Avoid bling. 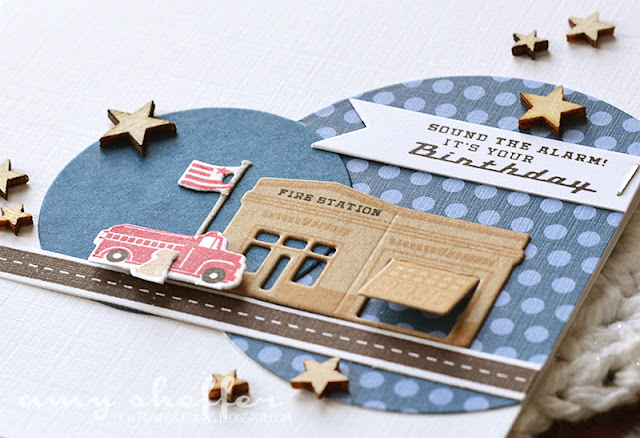 Instead use wood veneer embellishments (stars are great) or die-cut stars, maybe some ink splatter, something metallic (I used a staple to adhere the sentiment flag), or no embellishments at all. 4. Color is often the number one factor in creating a masculine project. Primary colors, more muted tones, and neutrals all generally work well. 5. And then, of course, comes imagery and icons. Scenes are so trendy right now, and are a good gender neutral choice. 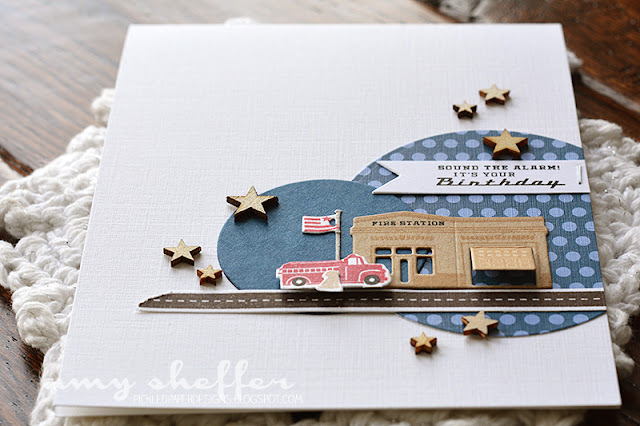 Certain imagery is stereotypically male -- transportation in general, and in this case the fire truck in particular. 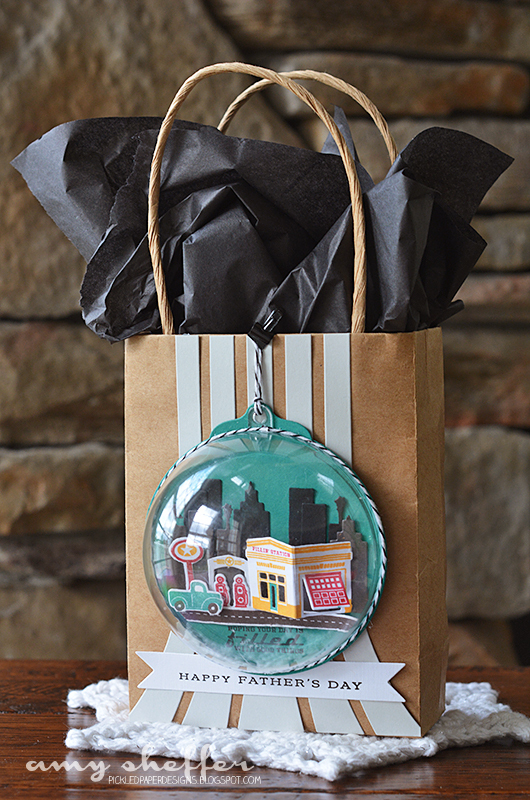 For my next project, I've created some gift packaging using Petite Places: City Station. I created a dome and used it as a tag for a plain kraft rope-handled bag. I stamped the Petite Places: City Station components to be a filling station this time, using the bright colors that you see on actual service stations. I love the hinged garage door, gas pumps, and oval sign. 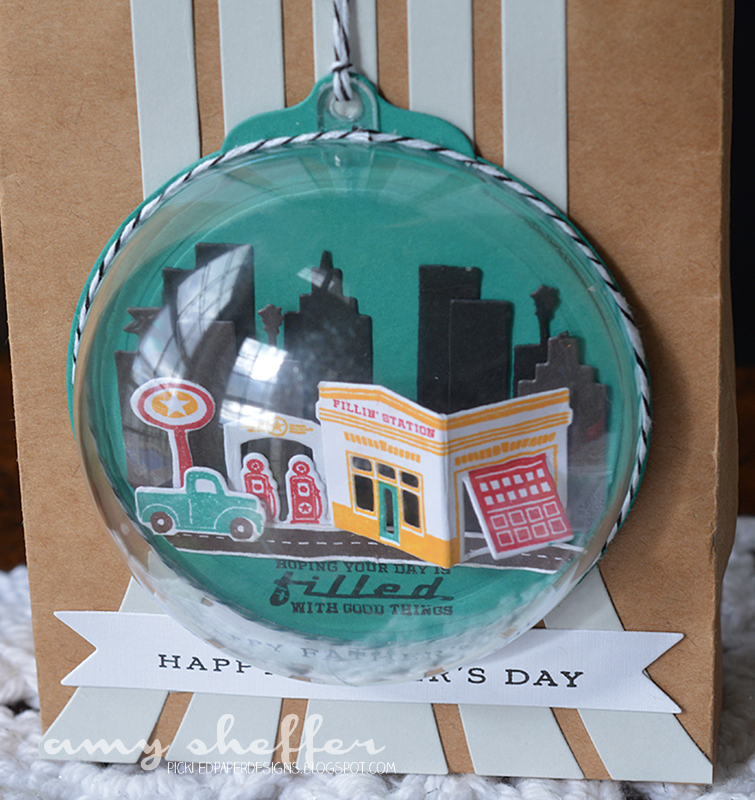 "Filling Station" is a good fit for pretty much anything you fill your gift box, bag, tin, etc. 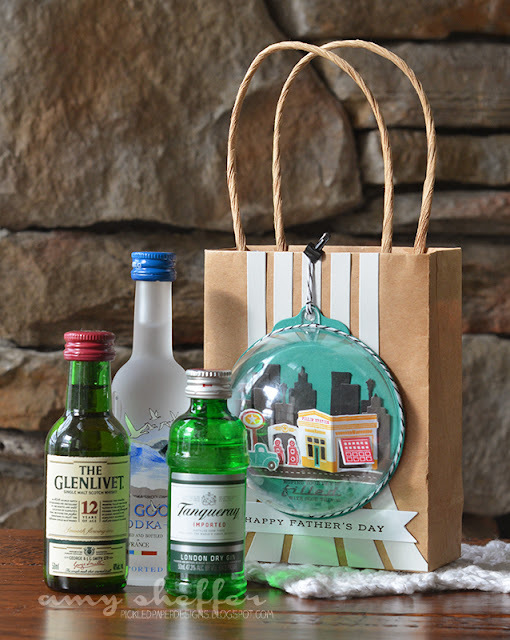 with, but I wanted to make my "filling station" a mini bar, and so I filled my bag with miniature alcoholic beverage bottles. 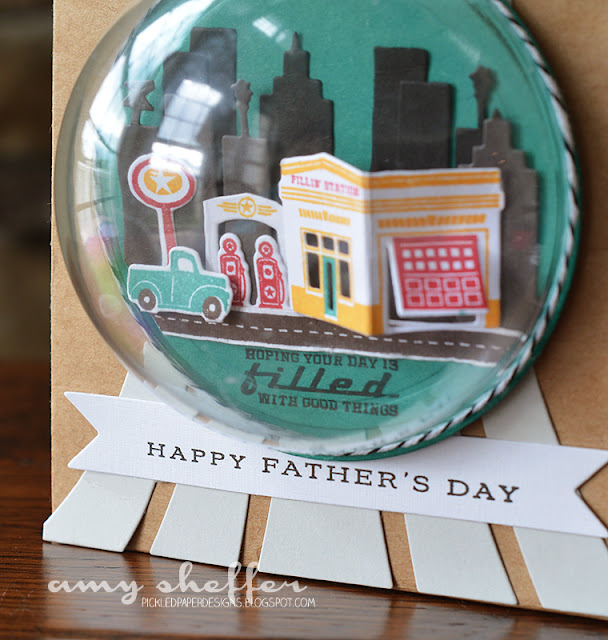 I customized the gift-giving occasion with a Happy Father's Day sentiment banner, stamped with Keep It Simple: Father and die-cut with the Double Ended Banners die. 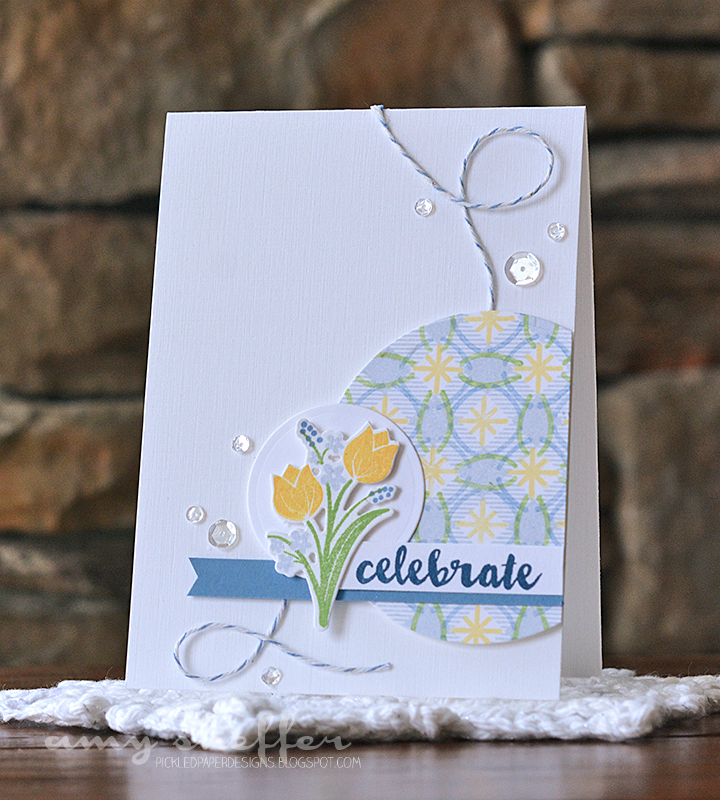 The flared Soft Stone stripes behind the dome were die-cut with the Rainbow Stripes die set. Here's more of a top-down angle, so you can see the dimension on the filling station building, which is just a tent fold secured along the left and right with liquid glue. 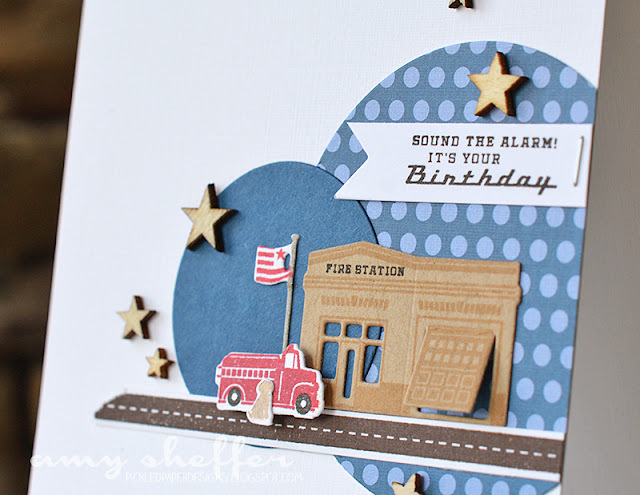 A couple of other fun details: the cityscape in the background was done by reconfiguring and layering True Black and Smokey Shadow skyline die-cuts from the Zappy Birthday die set. 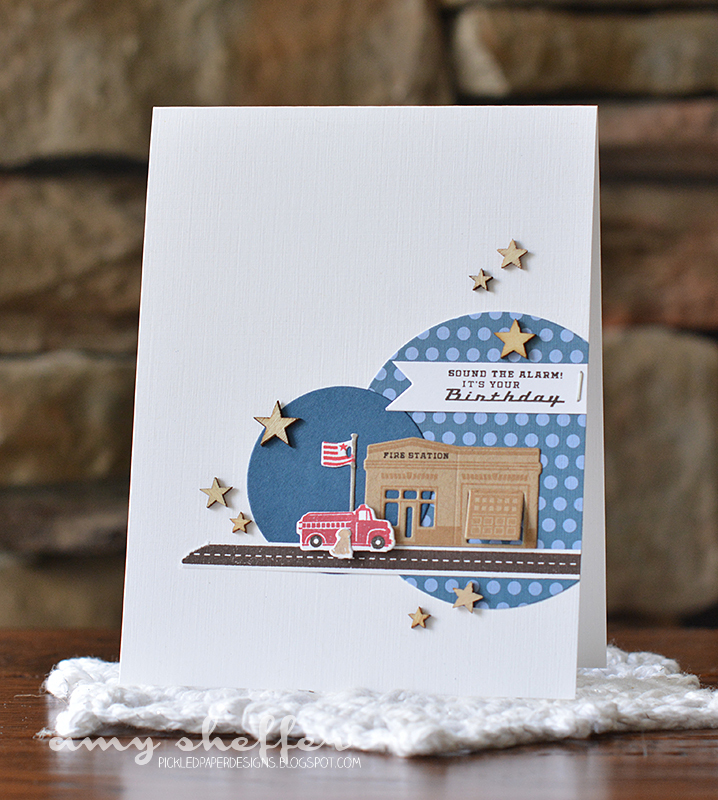 The road was done with one of the stamps from the new Plaid Builder set. Those dashed line stitches double as pavement lines when the stripe is stamped in True Black or Smokey Shadow (and the size is perfect for the Petite Places buildings). You really outdid yourself! What an amazing array of projects. I love the two looks you gave for the same sketch too! The zappy background looks great in your scene! Sweet gift bag. Good masculine card tips! Wow, Amy, I love all your fabulous projects! Thank you for the tips, too, as I can see they will be perfect in creating some much needed masculine cards. Your designs are gorgeous. You have a unique talent for showcasing products. I love the gift bag. 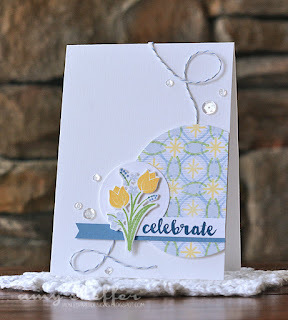 Fabulous cards, great designs too and thanks for all the hints and tips! Yipes! Adore your remake! And the domes are adorable! (Handsome? ), just showstoppers! Absolutely phenomenal creations. I just printed the cards to use as a sketch for a graduation card. You have convinced me I need the new Petite Places! Great projects! Making masculine cards is always a challenge for me. Thanks for the tips. I love your 'filling' station, what a fun gift!! As always, your details are impeccable! Amy - you are doing such an awesome job as a member of the Papertrey Ink design team. Love your tips on masculine cards and how you illustrated it with your two cards. I love your designs Amy! Especially the little buildings!! Inspired and so inspiring! I'm so glad that you're part of the PTI design team. Amy your cards are great! I have a horrible time with male cards, but the way you've broken it down is going to be a huge help. I'll be looking at a lot of me feminine cards in the future to see how I can change them to masculine. 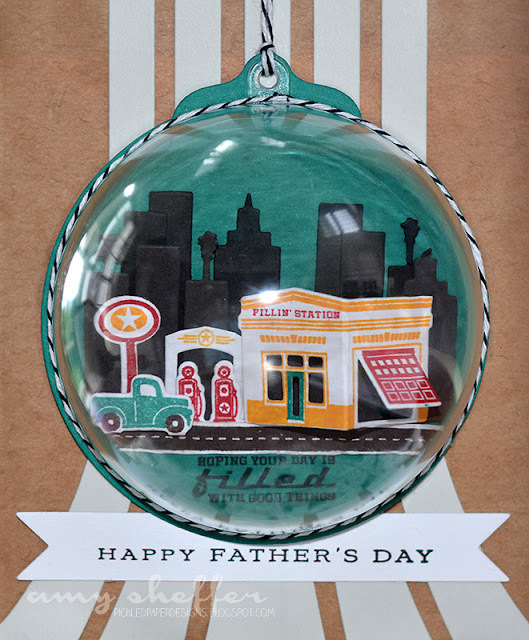 The filling station is adorable. Your creativity is amazing! I stated yesterday that you are an asset to PTI, I stand corrected....You are a Tremendous Asset!!!!!!!! You are so amazing...the guy version card is spectacular and the gift bag and ornament blow my mind. Your projects are so creative. What a fabulous set of dies! I instantly thought of the movie "Cars". OMG, each one is fab! So gorgeous!